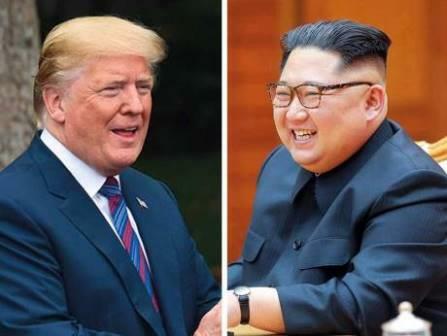 Washington: The White House said on Monday that a first meeting between President Donald Trump and North Korean leader Kim Jong Un will take place at 9am (5am UAE) in Singapore on June 12. “We are actively preparing for the June 12th summit between the president and the North Korean leader,” spokeswoman Sarah Sanders said in announcing the timing of the meeting. Sanders said that the White House “advance team” — which features military, security, technical and medical staff — were already on the ground in the Southeast Asian state. They are “finalizing preparations and will remain in place until the summit begins,” said Sanders. She added that Trump is getting daily briefings on North Korea in the runup to the landmark meeting. “I can tell you the president has been receiving daily briefings on North Korea from his national security team,” said Sanders. Experts have voiced concern that despite Trump’s claim to be the world’s greatest dealmaker, he knows little about North Korea, arms control or international diplomacy. With days to go before the meeting, it remains unclear whether Pyongyang is willing to take that step, or whether it is using the promise of talks as a way of easing Trump’s “maximum pressure” campaign. “I think it’ll be a process,” he said after welcoming top official Kim Yong Chol to the White House.